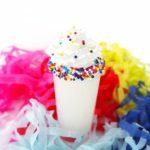 A fun and easy shot recipe for a Birthday Cake Shot made from vodka, frangelico, and lemon. Elle Talk is officially one year old! Okay my Blogiversary was really on Sunday but no matter. If you want to see that oh so sweet opening post you can by clicking here! It has been an amazing year in blogging for Elle Talk and I can’t believe how quickly we’ve grown. I have loved getting to know all of you! I talked a lot more in detail about that on my New Year’s post here. Today though, I don’t want to think about all of that, I just celebrate! Since Blogiversaries are a lot like Birthdays more than Anniversaries and I have a Birthday arriving soon. I thought it would be fun to celebrate with a shot! A Birthday Cake shot to be exact! Back when I was in college this shot was all the rage so I decided to bring it back! It’s just a sugar rimmed shot glass with Vodka & Frangelico (hazelnut liqueur) taken straight up, then immediately one bites down on a lemon wedge. Some crazy voodoo leaves you with a birthday cake taste in your mouth. How this taste like birthday cake, I’ll honestly never know. It brings up a lot of those question about who? how? where? too. The booze world is a weird place, folks. To dress this up a bit because this isn’t just a birthday, it’s a damn Blogiversary. So we need to be colorful AF. I decided to rid the sugar rim and dip the edge of a 1.5 oz shot glass with icing then coat it with sprinkles. We’re ditching the lemon to avoid sensitive teeth. We’ll instead start assembling the shot with 0.5 oz of fresh lemon juice into the bottom of the shot glass. (You want it to go in first so it’s the last thing you taste) Then put in 0.5 oz of Vodka and then 0.5 oz of Frangelico to your shot glass. Garnish with some whip cream on top. Your whip cream will begin melting into the shot turning it white like cake. When ready, tap the table and bottoms up! An easy celebratory birthday cake shot using vodka, frangelico, lemon juice, and whip cream. Then into the shot glass add your liquids in this order. Lemon Juice, Vodka, Frangelico. Top off with whip cream and serve. So that is my Blogiversary version of a Birthday Cake Shot! Which I think is perfect for the celebratory occasion! I wanted to give another quick thank you for reading my blog! Also, thanks for sticking around for all the crazy recipes! It’s been a delight getting to create these wild and unique posts for you this last year, and I really can’t wait to see what another year in Elle Talk will look like.